In collecting your personal information, we aim to provide you with a more customized experience. This information lets us provide services and features that we think are more likely to meet your needs. Of course, users may be able to use our products or services, or browse our Site(s) without providing any personal information, but once you give us this personal information, you are not anonymous to us, and we consider that you consent to the collection, use and disclosure of your personal information as described in this policy. This is information that may be used to identify you individually, including your name, shipping and billing addresses, phone number, email address, credit card information and date of birth. We request this information from you on and off our Site(s), for example, when you call us, sign up for our newsletter, visit or subscribe to our Site(s), use our mobile or web applications or purchase an item or service. From time to time, we may also request or obtain personal information about you and your interests through surveys, contest/sweepstakes entry forms, our mobile applications, social media platforms, or in other ways. You may always choose not to provide us with your personal information; however, this may limit our ability to provide you with specific products, services or information, or to offer you personalized content. This is information which we do not associate with individuals, such as IP addresses (a number that can be used to identify your location and Internet Service Provider), the type of browser or device you are using, and aggregated information about user activities on our Site(s), including the URL from which you came to our Site(s) and the URLs that you visited on our Site(s). We may collect information about you from other sources, including through interactive applications (such as mobile devices/applications and third-party services) and from commercially available sources (such as data aggregators and public databases). For example, if you access third-party services (such as Facebook) through or in connection with our Site(s), we collect information available about you through those services, including, but not limited to, personal information as well as publicly observable data, such as activities on blogs, videos, and other online postings. We also use a feature of your browser called a “cookie” to assign identification to your computer that may be placed by us or a third party with whom we partner. Cookies allow us to better understand your preferences and personalize the content on our Site(s) to give you a better overall experience. The unique user ID contained within your cookie automatically identifies your computer—but not you—to our servers every time you visit our Site(s). Cookies by themselves cannot be used to find out the identity of any user, but may be combined with identity information in our log files. You can turn off the cookie feature by using your browser preference options, but you may not be able to utilize some of the features or services on our Site(s) properly. Current versions of many Web browsers offer enhanced user controls for the placement and duration of cookies. Search for “cookies” under your web browser’s help menu for more information on the cookie management features available to you. Some web browsers offer a “Do Not Track” (“DNT”) signal that is a HTTP header field indicating your preference regarding tracking or cross-site user tracking. Although we’re currently unable to honor DNT signals, we do not collect personal information when you visit our Site(s) unless you provide such information to us. We also work with third parties that use tracking technologies on our Site(s) in order to provide tailored advertisements on our behalf and/or on behalf of other advertisers across the Internet. These companies may collect information about your activity on our sites and your interaction with our advertising and other communications, and use this information to determine which ads you see on third-party websites and applications. For more information about this practice and to understand your options, please visitwww.youradchoices.com (U.S.), www.youradchoices.ca (Canada) or the Network Advertising Initiative atwww.networkadvertising.org. 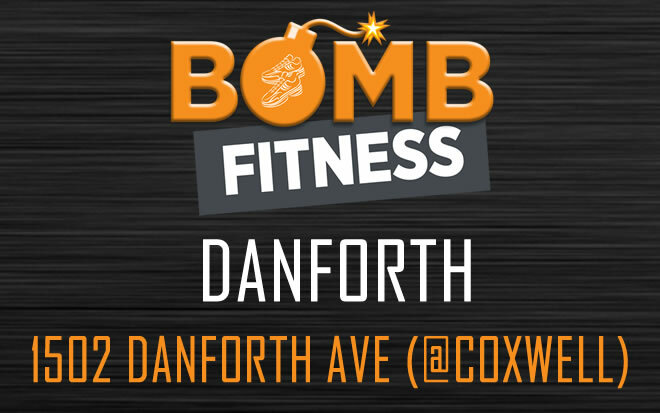 HOW DOES BOMB FITNESS USE THE INFORMATION IT COLLECTS? 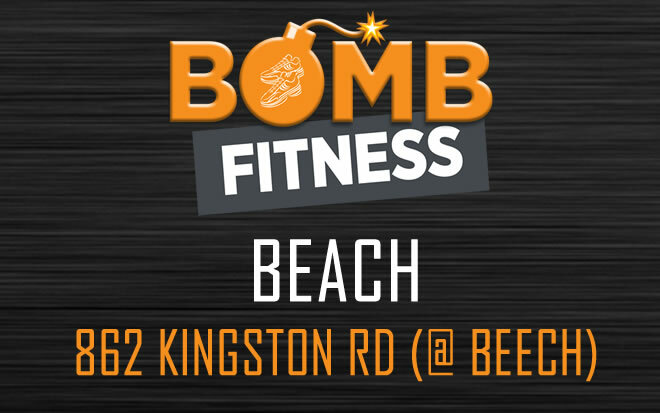 to contact you to see if you are interested in participating in market research regarding BOMB Fitness. For information about opting out of communications about our products, services or market research, or those of our partners’, please see our “Opt-Out Policy” section below. We may also use non-personal information (e.g., cookie and IP addresses information) to help diagnose problems with our server, administer our Site(s), count and track Site visits and purchases in the aggregate, personalize the Site(s) for each unique user, control the frequency of individual advertisements to individual computers, and target advertisements and promotions to broad demographic segments. TO WHOM DOES BOMB FITNESS DISCLOSE YOUR PERSONAL INFORMATION? When you make a purchase, we may need to provide personal information, including information such as your shipping address, billing information, telephone number, and credit card information, to third parties, including payment processing or shipping companies, as necessary solely to complete the transaction. We may, in our sole discretion, disclose personal information when we deem necessary or appropriate to law enforcement or other entities or third parties as required by law or to protect our rights or the rights of others, to prevent harm to persons or property, to fight fraud, identity theft, or otherwise to comply with the law or legal process, to respond to claims, to protect our systems and customers, to ensure the integrity and operation of our business and systems, or to protect the rights, property, or safety of BOMB Fitness and its employees or others. We may also disclose non-identifying transaction information to third parties for the purpose of accounting and record keeping. We may also disclose aggregate user data or non-personal information in order to describe our services to prospective business partners, advertisers, and others, but will do so only in a form that does not identify individual users. In addition, we may contact you via email or use targeted online advertising as permissible by law. In the case of email, we may include instructions to enable you to unsubscribe from future emails if you so choose. You agree and understand that while we will do our best to comply with your request, we shall not be liable for any problems or delays associated with the opt-out process. At various points and pages on our Site(s), you may be able to access or utilize tools and/or services offered by or in conjunction with third parties, including tools and services in connection with third-party social media and other Site(s) that would allow personal information to be transferred to such third parties. These third parties have separate data collection and privacy practices independent from ours, and thus BOMB Fitness cannot be responsible for their policies or activities. Please contact those third parties directly if you have questions about their privacy policies. No data transmission over the Internet can be guaranteed to be absolutely secure. As a result, while we strive to protect your personal information, we cannot ensure or warrant the security of any information you transmit to us or our online products or services, and you do so at your own risk. On our Site(s) and in communication with you, we may include links or referrals to businesses and websites operated by our business partners, affiliates, advertisers, and others. These third parties have separate data collection and privacy practices independent from ours, and thus BOMB Fitness cannot be responsible for their policies or activities. Please contact those third parties directly if you have questions about their privacy policies. Our Site(s) may include interactive online forums, blogs and other interactive technologies that may allow comments, messages, emails, and postings to be associated with a user’s name or email address. Any information you post is public information, and BOMB Fitness cannot control what use third parties may make of this personal information. All of these forums are public. Please consider this before you post. BOMB Fitness does not currently have a method for users to delete the personal information contained in our database; however, you can contact us to withdraw your consent for us to use your information at any time, subject to legal or contractual restrictions. Like almost every website, our Site(s) may be accessed by an international audience. By visiting any of our Site(s) and providing us with data, you acknowledge and agree that your personal information may be processed for the purposes identified in this policy. In addition, such data may be transferred and stored on servers located in Canada or otherwise outside your resident jurisdiction; such jurisdictions may have less stringent privacy practices than your own. Our third-party service providers may also be located outside of your jurisdiction. By providing us with your data, you consent to the transfer of such data. Personal information that is transferred or maintained outside of your jurisdiction could be accessible to law enforcement agencies according to the laws of the applicable foreign country. WHAT HAPPENS TO MY INFORMATION IF BOMB FITNESS IS SOLD TO OR MERGES WITH ANOTHER COMPANY? This policy may change from time to time. If we make any substantive changes to the policy in the future with regard to how we use your information, we will post those changes on our Site(s) in this location together with the date of the last update. Your continued business relationship or use of the Site(s) after the changes are posted constitutes your agreement to the changes, both with regard to information we have previously collected from you and with regard to information we collect from you in the future. If you do not agree to the changes, please discontinue your use of our Site(s) or business relationship with us.